This is an extremely easy lentil curry recipe. Despite their reputation of being rather boring - Lentils really don't have to be. They are both filling and nutritous and always offer a good alternative to meat and if they are cooked properly (like using a recipe like this) they can also be delicious. This dish takes about 25 minutes to prepare and about 30 minutes to cook. I have aimed this recipe to just serve one. This way you can easily multiply the amount ingredients by however many you need if you are cooking for more than one. 100g can of lentils or fresh if you so prefer. Heat the oil in a large frying pan and add the onions and garlic and fry for about 3 minutes. Next, add the tumeric and other spices and mix in well. Cook for another 2 minutes. The vegetable stock needs to go in next and then immediately addd the tomato puree and lentils. Bring the pan to the boil and then let it simmer for 4 - 5 minutes. Season with frsh black pepper and salt and add the cream. 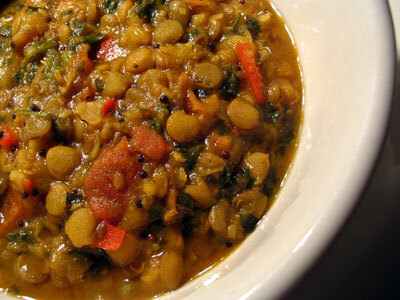 Warm up the chapattis and then tip the lentil curry into a bowl and serve alngside. Tip: Serve with a sprinkling of corriander.